The country's first subscription airline already has 400 people on a waiting list, but it also has 65 planes on order with an eye toward at least 44 more markets. NEW YORK (TheStreet) — Traditional commercial airlines need not be concerned, but they should definitely take notice — there's a new business model in the airline industry. The country's first subscription airline launched recently and already has 1,600 members and 400 people on a waiting list. Surf Air, based in Santa Monica, Calif., costs about $1,750 per month (plus a $1,000 initiation fee). That's about the cost of a first-class ticket in some markets. But for that fee, Surf Air members fly the airline as many times as they want during a 30-day period. It's a model that has earned much praise and publicity, including Surf Air being called "One of America's most promising companies of 2015" by Forbes. "There's a definitely a market for this type of offering," says Ron Peri, chief executive of Radixx International, an airline reservation and distribution systems provider. "A lot of executives will be drawn to it because it has a private jet feel. They get to escape the rat race of the big commercial airports and the indignity of airport checks." The company offers up to 90 daily flights on routes between about one dozen secondary airports in California, typically small airports that cater to private jets. Flying from such uncrowded locations is a key part of the airline's value proposition. Promising to remove the stress from flying, Surf Air says members never have to wait on the long lines associated with typical airports (they bypass TSA security) and get free parking and checked luggage. Surf Air passengers are greeted by a concierge and board a plane within just a few minutes of arrival. Aboard the planes are plush leather seats and ample workspace. 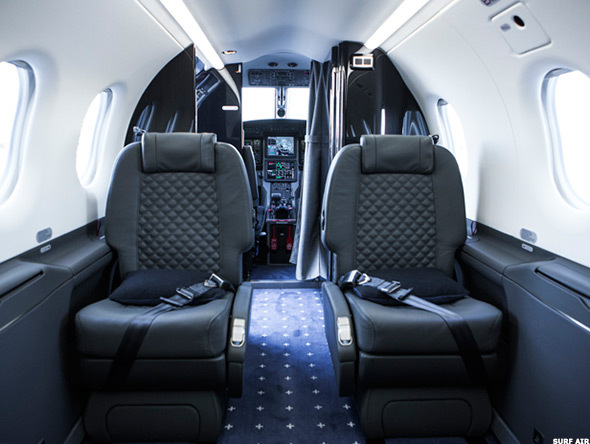 Surf Air flies eight-seat Pilatus PC-12 planes that have a BMW-designed executive interior. "When you and I go to the airport and are flying somewhere, I doubt there are too many among us who are excited about the trip," Surf Air CEO Jeff Potter says. "It's a pain point. It's parking, lines. It's just a stressful environment. [Surf Air] really makes the flying experience entertaining and enjoyable. We take a lot of the stress out." Although Surf Air's route offerings are limited, the airline is rapidly expanding locally and has set its sights on routes in other states. The airline's current destinations include such places as San Carlos and Oakland in the San Francisco area, Hawthorne and Burbank in the Los Angeles area and Truckee in Lake Tahoe, Santa Barbara and Carlsbad. Sacramento is slated to be added in August and Palm Springs in November. Texas will start seeing Surf Air planes early next year, after which Florida and the Northeast will be added. Peri estimates that there are at least 44 additional markets in the U.S. that could support the Surf Air business model. Routes can't be too long or too short, or it won't work out financially, he says. With that in mind, Peri suggests that flights between such places as St. Louis and Chicago, New York City and Washington, Boston and New York City and New York City to Albany would all make good expansion choices. Some municipalities may even provide funding for Surf Air to come to their communities, Peri predicts. Currently flying nine planes, 65 more have already been ordered. The airline will take delivery of six to seven more planes over the coming months. "We are beyond proof of concept," says Potter, adding that Surf Air has very little competition to speak of right now. Private jet operators, fractionals and NetJets (which offers fractional ownership and rental of private business jets), all have a different price point and serve a different market, Potter says. Peri, of Radixx International, says Surf Air has come up with a model that has panache and status at a price point that even executives at smaller businesses can likely afford. "I think it's relatively easy for an executive, if they are flying several times a month, to justify this," Peri says. "I don't think it's that tough of a sell to the business community. Many people will sign up even if they don't fly in a month. It's the convenience of knowing 'If I have to, I can take advantage of this.'" In fact, the vast majority of Surf Air's current customers, nearly 90%, are business fliers. The airline membership seems to make the most sense and is most cost effective for business travelers who commute regularly between two locations. But Surf Air also attracts those who own a second home in one of California's many vacation destinations — thus the airline's move into markets such as Napa and Truckee. "What they're doing is not all that different from what trains have been doing for years — where you buy a monthly pass," Peri says. Those interested in Surf Air membership need not be discouraged by the hundreds of people already on the waiting list. Many of those people are waiting for markets that the airline has yet to begin serving, Potter says. New members are still being added every day. "I think we are giving people an alternative," Potter says. "We're not for everybody. We're not for the infrequent fliers. But this is certainly an innovation of what you can do." But with such small passenger loads and a limited number of financially feasible routes, Surf Air is not necessarily a threat to large, commercial airlines. "We fly executive airplanes that have just eights seats, so it's not like we are going to have other airlines running scared," Potter adds.